ALS Research Forum | C9orf72 RNA foci: Much Ado About Nothing in ALS and FTD? C9orf72 RNA foci: Much Ado About Nothing in ALS and FTD? Clumps of RNA and associated proteins filling the nuclei of brain cells carrying an ALS-linked repeat expansion in the C9orf72 gene certainly look like they could mean trouble. 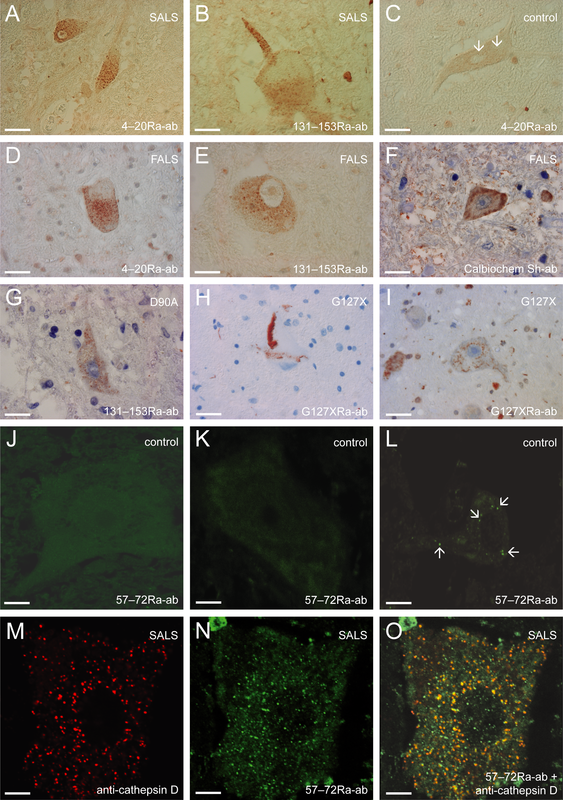 But according to a large post-mortem brain tissue analysis of 63 expanded repeat carriers, published online May 15 in Acta Neuropathologica, there is very little correlation between the number or distribution of these nuclear RNA foci and if and when people develop ALS, frontotemporal dementia (FTD), or a combination of both. “They likely are not the main determinants of whether somebody gets FTD or ALS,” concluded Rosa Rademakers of the Mayo Clinic in Jacksonville, Florida, senior author of the study. “But I don’t think that means that they’re not important, or they’re not contributing to the disease.” More likely, she suspects, the RNA foci are players in an ensemble cast, which may include C9orf72-associated dipeptide repeat proteins (DRPs). These RNAs and proteins could act in concert with a variety of factors such as a person’s lifestyle, genetic and epigenetic makeup, and loss of C9orf72 function to determine whether, when, and how these expanded repeats might manifest as disease. 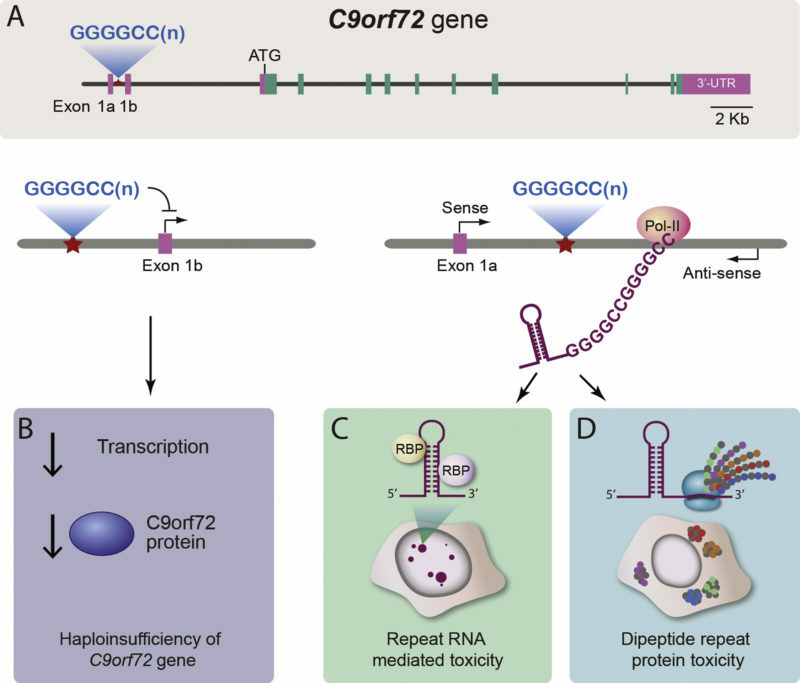 C9orf72 repeats result in a variety of disease phenotypes—or may not cause symptoms at all. That leaves people harboring the expansion in the dark about what to expect, notes Mayo Clinic’s Marka Van Blitterswijk in Florida, co-senior author of the study. She, Rademakers, and colleagues have already investigated how the size of these repeats, the presence of specific C9orf72 isoforms, and the DPRs line up with clinical and pathological features of the disease (see November 2013 conference news; Van Blitterswijk et al., 2013; Van Blitterswijk et al., 2015; Gendron et al., 2015). They found some significant correlations, such as a link between increased levels of one C9orf72 isoform and survival after onset (Van Blitterswijk et al., 2015), but the understanding of what underlies the clinical and pathological variability remains far from complete. RNA foci, the researchers reasoned, might also be relevant to that variability. In 2012, first author Mariely DeJesus-Hernandez began to count RNA foci in the post-mortem brain tissue of people harboring expanded C9orf72 repeats. Upon completion, DeJesus-Hernandez had examined the frontal cortex and cerebellum of 63 expansion carriers, including people who had ALS, FTD, or a combination of both, and one who had Alzheimer’s disease. To carry out this analysis, she used fluorescence in situ hybridization (FISH) to label RNA foci containing either sense-direction or antisense C9orf72 RNAs, since both directions can be transcribed and form foci, and thereby potentially could contribute to the disease (see November 2013 news; Zu et al., 2013; Gendron et al., 2013). Others have assessed RNA foci patterns in the brain before (Mizielinska et al., 2013; Cooper-Knock et al., 2015), but DeJesus-Hernandez analyzed a much larger sample set. To assist with the monumental task of counting all those foci, Rademaker’s team developed and validated an automated computer pipeline to identify the cell nuclei and count the foci in each microscopic field. The computer’s results correlated well with those obtained by human eye, according to their analysis. Using this approach, DeJesus-Hernandez found that in the frontal cortex of the brain, 32% of neurons contained sense RNA foci and 16% contained antisense RNA foci in the nucleus. In the cerebellum, 23% and 1% of granule cells contained sense and antisense RNA foci, respectively. In the same area, 70% of Purkinje cells had sense RNA foci and 74% of them had antisense RNA foci. Then, Van Blitterswijk and colleagues asked whether the pattern of RNA foci would correlate with an array of clinical and pathological features including disease type, age of onset and death, repeat length, number of total C9orf72 transcripts, and the presence of DPRs. They came up nearly empty. For example, there was no indication that people with more foci in the frontal cortex were more likely to have FTD than ALS. But there was one statistically significant hit: the older a person was when they first showed symptoms of FTD, the higher the number of antisense RNA foci present in the frontal cortex at death. There are two possible interpretations, said Rademakers. It could be that the antisense RNA foci are somehow protective, keeping the people harboring C9orf72 expanded repeats healthy longer (see September 2015 news; Tran et al., 2015). But she and Van Blitterswijk think it’s more likely that the people who had a later age of onset were simply older when they died, and thus had more years to accumulate them. Adrian Isaacs of University College London, who was not involved in the study, agreed that the idea of antisense RNA foci being protective seems unlikely. If that were true, he pointed out, one would expect to see the number and/or distribution of these foci to correlate with some of the other disease measures Van Blitterswijk examined. “There’s no consistency,” said Isaacs, adding that the paper confirms a general impression in the field that there are no obvious harmful effects of RNA foci. But that does not mean that all C9orf72 RNA foci are absolved of any link to ALS and/or FTD, according to Isaacs. “The one thing the paper doesn’t address is cytoplasmic [RNA] foci.” These RNA foci are less frequent than the nuclear ones in the brain, according to a 2013 analysis led by Isaacs. But he and his colleagues did detect them in at least 1% of neurons in people with C9orf72-linked FTD (Mizielinksa et al., 2013). Therefore, he said, soluble C9orf72 RNA or RNA foci in the cytoplasm could still play a role in the disease. But it’s clear, from this and previous studies, that there’s no starring role for RNA foci in C9orf72-based ALS, commented Robert Baloh of Cedars-Sinai Medical Center in Los Angeles, California who was not involved in the study. For example, he said, some mouse models carrying C9orf72 repeats develop RNA foci but not neurodegeneration (see December 2015 news; O’Rourke et al., 2015; Peters et al., 2015). Plus, RNA foci appear early in neurons derived from induced pluripotent stem cells from patients, Baloh said. That suggests to him that in people, they probably appear in young neurons, decades before any symptoms—making it hard to see a link between the foci and the onset of the disease (see July 2016 news; Almeida et al., 2013; Sareen et al., 2013; Ho et al., 2016). “This does not rule out that [RNA foci] cannot contribute in concert with other factors,” he added. One more piece of evidence supports that idea, said Van Blitterswijk: their single case with Alzheimer’s disease, who also had a secondary diagnosis of FTD. That woman had the highest percentage of antisense foci in the brain of all the subjects tested, 28% of her cells. And, her brain had the most sense RNA foci in the cerebellum, 54% of granule cells and 89% of Purkinje cells. She also exhibited some of the highest levels of C9orf72 transcripts and DPRs, but relatively few repeats, at about 8 kb. Perhaps, Van Blitterswijk and Rademakers hypothesize, the combination of these extreme characteristics may explain why she developed the unusual phenotype of Alzheimer’s disease with FTD, though they caution it’s only one case. Van Blitterswijk added that tests to measure RNA focus load, along with those for DPR quantity, should still be useful to test target engagement in preclinical studies of anti-C9orf72 therapeutics (see February 2017 news). In human clinical trials, DPRs may have the advantage; there are already two tests to detect at least one version, poly-glycine-proline, in cerebrospinal fluid (see March 2017, April 2017 news; Gendron et al., 2017; Lehmer et al., 2017). It would likely be trickier to identify RNA foci themselves in blood or other easily accessible tissues from a living person, Rademakers said. However, she speculated, it might be possible to see transcriptional changes when RNA foci form and RNA-binding proteins are sequestered. Those changes could theoretically serve as a biomarker in developing a treatment. Tran H, Almeida S, Moore J, Gendron TF, Chalasani U, Lu Y, Du X, Nickerson JA, Petrucelli L, Weng Z, Gao FB. Differential Toxicity of Nuclear RNA Foci versus Dipeptide Repeat Proteins in a Drosophila Model of C9ORF72 FTD/ALS. Neuron. 2015 Sep 23;87(6):1207-1214. [PubMed].